In another time, The Dark Crystal was the Balance and Truth in the Universe, but was destroyed dividing the world into two factions: the wicked Skeksis and the peaceful Mystics. Now as the convergence of the three suns approaches the Crystal must be healed or darkness will reign forever. It is up to Jen, the last of his race, to carry out the prophecy that a Gelfling will return the missing chard of crystal and destroy the Skeksis’ evil Empire. But will Jen be up to the challenge of battling the unknown...? The Dark Crystal was groundbreaking for its time and nothing has come close to recapturing the same magic since. It was the first Jim Henson movie that relied solely on puppets to carry the story and the universe and creatures that were created were original and captivating. I was 12 when it was released in cinemas, although I admit that I didn't go to the cinema to see it, but when it was released on VHS video I totally loved it. I watched it too many times to count, but I haven't revisited it for many years, so I was looking forward to see how well it had aged. In truth, it's the sort of movie that will never really age, due to the fact that it stands on its own. It neither mimics styles or trends of the time nor has anything really come close to copying it. The practical aspect (the fact that there are few special effects and all the action was performed live to camera) make the movie feel more realistic. In addition, the design of the characters, along with the puppeteering, is so impressive that you forget that you're basically watching a bunch of Muppets. The story is your typical Hero's Journey. Which follows the main character, Jen, as he must track down the missing shard of the Dark Crystal and make it whole again to stop the evil overlords, the Skeksis, from continuing their tyrannical reign. He's helped along the way by the only other of his kind, Kira. And that, in a nutshell, is all there is to it. But the story, while still pretty strong, is secondary to the creatures and the world conjured up by the film's conceptual designer, Brian Froud. Extras include an interesting audio commentary with Froud. While for most movies the concept designer is instrumental in creating the basic look and feel of the universe the movie is set in, Froud's work is probably one of the most intense for a single project. The film took five years of his life to bring to fruition and not only was he responsible for the basic concept art, but he also oversaw every aspect of the movie to the point where he was designing characters on the back of what the creature modellers were experimenting with. So, he'd take the materials and animatronic components into account and then redesign a character to incorporate these aspects so that the puppeteers would be able to create a more believable performance. Interesting aspects of Froud's commentary include the fact that the "Crystal" in the title was accidental. After working on the project in the early stages, Henson said to him: "What's this Crystal you keep referring to?" It transpired that Henson had original envisaged a "chrysalis" as his original concept of the movie revolved around rebirth; Froud's original design of the Skeksis saw them more fish like. In addition he disagreed with Henson on the size of the characters. Froud wanted them to be huge in order to make them appear more menacing. Henson wanted them more Muppet sized, as this was something he was comfortable with. Froud finally convinced Henson to go large. This was also cinematographer Oswald Morris's last film before retirement. He was very keen to shoot the film so that it looked like a Froud painting and the film was lit and shot to get as close as possible, without the image looking flat. Other extras include Storyboard Track (Picture in picture feature that runs with the film and shows concept sketches and storyboard); The Myth, Magic and Henson Legacy (10 min, 27 sec retrospective look at the film with interviews with Lisa Henson and Toby Froud; The World of the Dark Crystal (57 min, 26 sec original '80s behind the scenes feature which includes some interesting onset footage); Reflections of the Dark Crystal (36 min, 41 sec - 2 features (Light on the Path of Creation and Shard of Illusion) which can be played individually or as one feature. 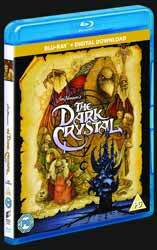 Lots of interviews as well as test and behind the scenes footage); Deleted Scenes: Funeral Scenes (3 min, 48 sec); Original Skeksis Language Test Scene (22 min, 49 sec - With an introduction by David Odell (who wrote the screenplay for the movie), this feature contains a number of scenes with the original Skeksis language track as well as Frank Oz providing the voice of Aughra); Storyboards (10 x images from the storyboard); Photo Galleries (3 x features that look at drawings of characters); Teaser Trailer (37 sec); and Theatrical Trailer (1 min, 19 sec). After watching the originally intended Skeksis language scenes, I'm wishing that there had been another cut of the film included on the Blu-ray, which reinserted the original language track (although not for the voice of Aughra) as the Skeksis scenes are a lot more menacing and sinister when you have no idea what they're saying. If you haven't seen this movie in a while, this is the perfect opportunity to revisit it. Froud's audio commentary is worth the asking price alone. This is still a fresh and beautifully crafted movie.